The 1000 year anniversary of Thang Long-Hanoi has attracted great attention from many international newspapers and news agencies. Justin Mott, a reporter from the New York Times came to Hanoi on the anniversary days to catch memorable moments of the Vietnamese capital city. Red flags with their single gold stars filled the streets and banners celebrating the city’s 1,000 years of history were trumped by others, he said in his article. 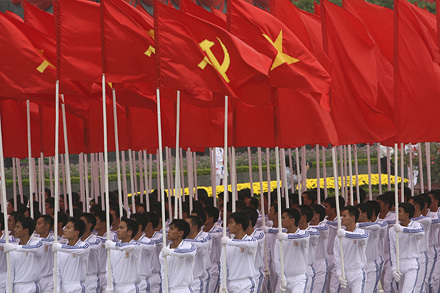 Bloomberg focused on Vietnam’s biggest-ever parade on October 10 in Hanoi with the participation of 31,000 people. Bloomberg also said that the Hanoi authority canceled fireworks displays at all except one of 29 planned venues in order to give money to victims of floods in central Vietnam. It also added that, for Hanoi’s 6.5 million residents, living standards have risen for the past two decades. The city will probably post the fastest average economic growth of any city globally between 2008 and 2025, PriceWaterhouseCoopers said in a November report. The Christian Science Monitor said “this celebration is more than hoopla; it is an effort to boost tourism and provoke a sense of nationalism among residents”. This week for the first time Vietnamese officials are allowing the public to view some objects that were unearthed in the archaeological dig across from Ho Chi Minh Mausoleum. Located in the centre of Hanoi, the site, which was accidentally discovered in 2002 during the construction of the new National Assembly building, was included in the World Heritage List by UNESCO this summer. Zan-Hee Oh, a programme officer in UNESCO’s Hanoi Office, said the archaeological site proved Hanoi\'s age.